Our private Australia tours are carefully created to deliver a personalized adventure like no other. 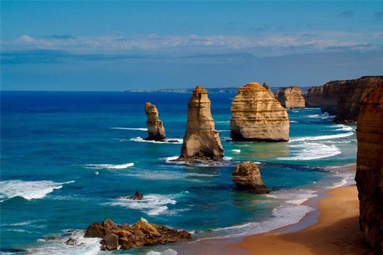 Our special Australia itinerary is loaded with the most appealing Australian experiences and activities. We can customize this private tour just for you. Any element can be tailored – activities, length, hotels and destinations. 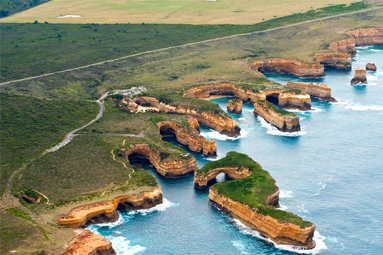 Here is just one of our favorite Australia itineraries. Day 1 SYDNEY ARRIVAL On arrival you will be met & transferred to your hotel by private transfer. Your suggested accommodation at: FOUR SEASONS HOTEL. 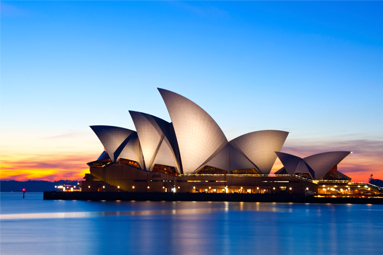 Sydney, capital city of New South Wales, is the major gateway to Australia. Sydney is a maritime city, its natural harbour unsurpassed in beauty. Houses crowd to the land's edge interrupted by sheer rocky cliffs and preserved bushland and the striking forms of the Harbour Bridge and Opera House stand sentry to the city. Sydney has an international flavour. The numerous nationalities which have settled here contribute to a varied and fascinating blend of restaurants, shops and night- life. This afternoon will be free at leisure. Day 2 SYDNEY Breakfast at your hotel this morning Harbour Day Sailing will collect you at your hotel; Experience Sydney's true beauty onboard a Luxurious harbour vessel. Encounter many wonderful places of interest whilst travelling at your own pace. Soak up the sun and the fresh air. 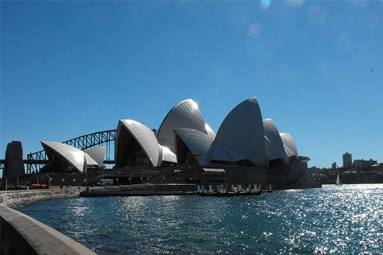 Cruise under Sydney Harbour Bridge and view the Opera House, Circular Quay and the Rocks. A great spot or taking a few photographs. After your sailing on Sydney Harbour you will be met by your private driver guide to commence your half day city sights of Sydney We travel to the charming Rocks area, where you take a stroll around the historic area, with its quaint old cottages, pubs & churches. Rejoin the vehicle & travel along Macquarie St, the seat of government for NSW, the Mint & Hyde Park Barracks. Travelling past St Mary’s Cathedral, you visit Mrs Macquarie’s Chair for an unsurpassed view of Sydney Harbour, the Opera House & Bridge. Continuing along the shores of Sydney Harbour, you travel through Kings Cross, Double Bay & Rose Bay. Passing by the up market real estate, we pause briefly for morning tea in the beautiful Sydney Harbour National Park. We then travel further to South Head, with its breathtaking views of Sydney Harbour & the city. Take a short stroll along the cliff tops & rejoin the vehicle to continue to Bondi Beach & Centennial Park returning to your hotel where your tour ends. 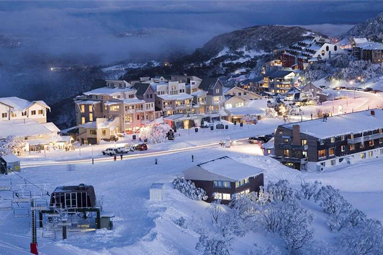 Day 3 SYDNEY Breakfast at your hotel this morning private driver guide will collect you at your hotel for the following 4WD Blue Mountains touring (private charter); This fantastic Ecotour begins at your hotel & the historical Rocks area of old Sydney. Heading westwards across the coastal plain we make our way to the Great Dividing Range of Australia. It is here we leave the ‘average’ Blue Mountains tourist behind & enter the National Park to unlock a piece of Australia We visit an ancient Aboriginal site & outstanding lookouts; examine rock formations & the unusual plants & wildlife that abound the area. From the quaint little village of Leura we skirt around Cliff Drive to Katoomba where you will find yourself looking out over the magnificentJamieson Valley (Australia’s Grand Canyon) &the Three Sisters. We enjoy a delicious lunch including a selection of fine Australian wines with a cheese platter under the canopy of the Australian bush. Before returning to Sydney we drop into a hidden valley where we roam the area, seeking out the many kangaroos that graze in the wild (conditions permitting). Reluctantly we leave the National Park passing through the Olympic 2000 site, arriving at your hotel around 5.30pm. Day 4 SYDNEY – HAYMAN ISLAND Breakfast at your hotel this morning Private transfer to Sydney airport. Fly Sydney to Hamilton Island (own arrangements). Connect with the launch transfer to Hayman Island. Hayman is an international standard resort complex offering the ultimate in luxury accommodation and service. Set in 13 hectares of tropical gardens and set around a giant swimming pool lagoon and freshwater pools, Hayman offers superb cuisine and a variety of water sports, tennis, fitness and spa centre. Your suggestion accommodation: HAYMAN ISLAND RESORT GREAT BARRIER REEF DAY Sixteen and Seventeen HAYMAN ISLAND – AT LEISURE. Enjoy breakfast daily. These days are free to explore beautiful Hayman Island. Day 5 HAYMAN ISLAND – HAMILTON ISLAND – CAIRNS – DAINTREE Enjoy breakfast this morning. Connect with the launch to Hamilton Island. Connect with your flight to Cairns (own arrangements). 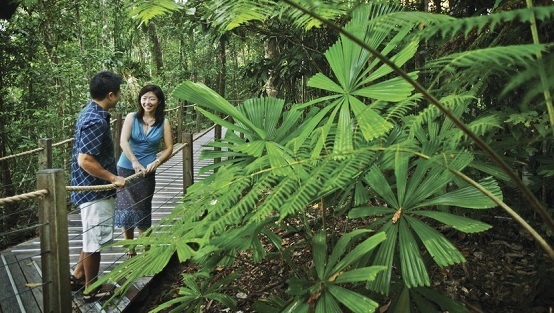 Upon arrival in Cairns you will be transferred to your accommodation in the Daintree. Your suggested accommodation: SILKY OAKS LODGE TheDaintree and Cape Tribulation is a pristine region of lush tropical rainforests, deserted white beaches, sleepy rivers and breathtaking natural beauty preserved by World Heritage listing for future generations. A naturalist's paradise, the region brings the natural wonders of the reef and rainforest together and is recognised for its superb wildlife and eco-tourism. Day 6 DAINTREE Breakfast at your hotel this morning Australian Wild Escapes will collect you at your hotel for your private 4WD tour; travel through the rich farming areas toward the World Heritage Listed forest region of Cape Tribulation. We step aboard our own personalised craft for a cruise on the mirrored smooth waters of the Daintree River. We cruise close to riverbanks and under the overhead canopy of the rainforest seeking out the vivid Ulysees Butterfly, Kingfishers and various other wildlife. The cruise takes us through silent backwaters where crocodiles can normally be seen basking banks Arriving on the northern side of the river we enjoy a home-style morning tea at Thornton Beach before returning to our vehicle and making our way towards Cape Tribulation and the Coral Sea. Just before we get there we stop at the outstanding panoramic picture postcard view at Alexandra Range Lookout. From here you'll have a spectacular view of the mouth of the Daintree River. Lunch is a special treat today, deep under the Rainforest canopy. We enjoy a delicious lunch with a chance and is a unique opportunity to enjoy quality food, whilst bathed in the serenity of the Tropical Rainforests. Our last stop and final lasting impression will be at one of the magical boardwalks. This is a specially constructed rainforest and mangrove walk, which will allow our guide to immerse you in the secrets of the rainforest. You may even get the chance to spot a brightly coloured Southern Cassowary. Fallen fruit and fruit on low branches is the mainstay of its diet so you may well see one ruffling through the undergrowth. You will be back at your accommodation late afternoon. Day 7 DAINTREE – CAIRNS – AYERS ROCK Breakfast at your hotel this morning Private transfer from your hotel to Cairns airport. Fly Cairns to Ayers Rock (own arrangements). On arrival to Ayers Rock, you will be met and transferred to your hotel by a representative from Longitude 131. Your suggested accommodation: LONGITUDE 131o AYERS ROCK RESORT Experimental travel is about providing a unique opportunity, allowing guests to be personally affected by their travel experience, be it spiritual, cultural or educational. Longitude 131 offers a true 'safari' experience in Central Australia and is a unique way to experience the desert, surrounding eco system, Aboriginal culture and expansive views of Uluru. Uluru national park, 450 kilometres south-west of Alice Springs, encompasses just a small portion of the vastness of central Australia. The spectacular Ayers Rock (Uluru) and the Olgas dominate the open barren landscape of sand plains and mulga woodland rising up out of what is now a buried mountain range. These magnificent peaks are of great significance to the region's tribal Aborigines and visitors to the park are able to see the many sights and cave paintings that form an important part of central Australian Aboriginal mythology. Did you know? The Outback town of Silverton near the New South Wales/ South Australia border has featured in more than 140 films and commercials including Mad Max 2 , Priscilla Queen of the Desert, Razorback, Young Einstein, and A Town Like Alice. Day 8 AYERS ROCK AT LEISURE A touring program is included in your package stay at Longitude. Please discuss touring options with your hotel concierge. Day 10 MELBOURNE Enjoy full breakfast. This morning is free at leisure. Australian Wild Escapes will collect you at your hotel (early afternoon). Enjoy a short city sights tour. From your hotel your tour will take you southeast of the city to the rugged southern coastline. Tour Phillip Island and visit the Koala Conservation Centre to see a protected Koala colony. Walk in nature reserve bush land and wetlands to see Wallabies and birdlife in the wild. Penguins come ashore each evening at dusk. Boardwalks enable the visitor to gain close contact with the penguins in the dune area. Enjoy a fish and chip dinner at the Jetty Restaurant in the township of Cowes at Phillip Island. Return to Melbourne inland, arriving at your hotel late evening. Day 11 MELBOURNE Enjoy full breakfast. Meet your driver guide from Epicurean for your full day private charter. With a rich history stretching back to the first settlers, the Yarra Valley is not only one of Australia's oldest wine producing regions, but also one of the most diverse, containing large commercial enterprises and small boutique producers. Less than an hour's drive east of Melbourne, the Yarra Valley is home to over 40 wineries and is best known for its success with pinot noir, fine chardonnays and also cabernet sauvignon and shiraz varietals. The Yarra Valley offers a unique food and wine experience, with many wineries specializing in the foods of the region at the cellar door and adjacent restaurants. Experience a private tasting in the Trophy Room at family owned De Bortoli Winery. Visit the Produce Store at Yering Station, showcasing produce from the Yarra Valley region and taste at the cellar door of local wineries. Visit DomaineChandon Australia, ideally located in this world renowned wine-growing region. Producing premium quality MethodeTraditionnelle sparkling wines from the classic Champagne grapes, Chardonnay, Pinot Noir and Pinot Meunier, DomaineChandon is dedicated to producing quality Austrailan wines. Day 12 MELBOURNE – DEPARTURE Enjoy full breakfast. Meet your driver and transfer to the airport for your departure flight.